Saibaba Seattle is a Non Profit Tax Exempt Organization with 501(C)(3) status. All the donations to Saibaba Seattle are Tax Deductible. Shri Sai Baba is revered as one of the greatest saints ever seen in India, endowed with unprecedented powers, and is worshipped as a God incarnate. Baba stated that His mission is to "Give Blessings" without discrimination to all, and He proves it in myriad ways by healing the sick.ing people into harmony within themselves and with each other and, above all, in effecting the spiritual evolution. Read more..
An outstanding aspect of Sai Baba is that He is beyond distinctions of religion, caste or creed. He embodied all religions and preached the Universal religion of Love. 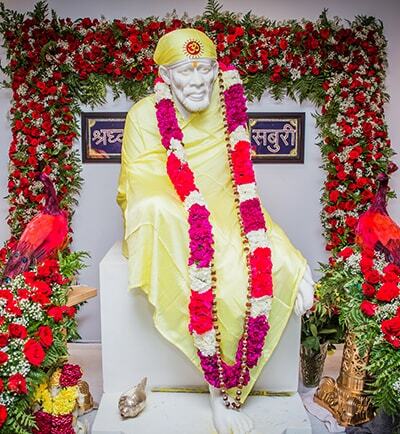 People today flock Shirdi in ever-increasing numbers to pay homage to the Divine and to experience the truth of Baba's promise that He would be active in answering devotees' prayers even from his tomb. See less..